A frustration that many people have with taking notes to work on an iPad or a computer is that you have to type them. This means that you can’t make sketches. But the iPad has a touchscreen, so it does let you draw with your finger or a stylus. That’s where the $7.99 PhatPad comes in: It’s a note taker that lets you create drawings in your notes as well as record audio in your notes. How cool is that? Drawing is easy: Just start drawing with your finger or stylus on the blank screen that appears when you tap the + icon at the top of the file list. Just be sure that the Draw button (the pen icon at upper right) is active, which it is by default. To delete lines and shapes that you’ve drawn, tap the Erase button (which looks sort of like a chalkboard eraser) and then draw through whatever you want to delete. If the eraser touches part of a line or curve, it erases the whole object. You can change the thickness and pen color of the “pen” by tapping the palette icon at the upper right of the screen. The icon in the center of the pen wheel that appears toggles between pen thickness and color. To navigate PhatPad, tap the Grabber tool (the hand icon); now your gestures don’t draw anything, but instead do the iPad’s standard scroll, rotate, expand, and pinch gestures. Swiping horizontally moves you among pages, as does tapping the < and > icons on either side of the current page number at top. Notes are saved automatically as you work with them. To create a new note, tap the Add button (the + icon) at the upper left of the screen. To see previously saved notes, tap the Files button (the icon of two pages) next to it. What PhatPad can’t do is use the iPad’s onscreen keyboard to type. 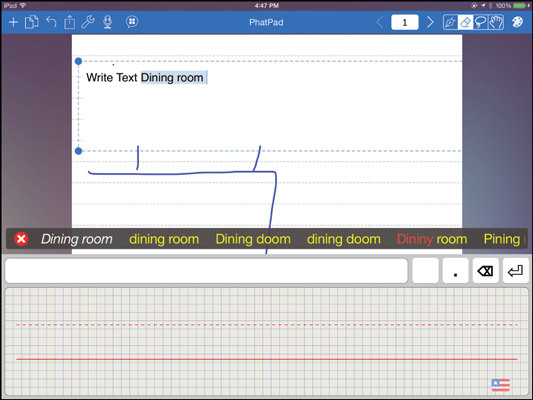 To write text, you turn on its handwriting recognition. To do so, you tap Insert Text in the Tools pop-over, which you access via the Tools button (the wrench icon) in the upper left of the screen. You can convert existing handwritten text to typewritten text by selecting it with the Selection tool (the lasso icon): Draw a rectangle around the handwriting, and when you release your finger from the screen, a menu appears. Tap Convert to Text. The Selection tool also lets you change the pen ink and thickness for any selected drawings, handwriting or not, as well as delete, copy, cut, and move the contents. To add a sound recording to your note, tap the Record button (the microphone icon) at the upper left of the screen; then begin speaking or playing the audio you want added to the current note. You can tap Pause to pause the recording and then tap Pause again to resume. Tap Stop when done, or Cancel (the X icon) to throw away that recording. If you do save the recording by tapping Stop, the Record button becomes the Playback button (speaker icon); tap it to play your recording. You can have only one recording per note. PhatPad has the standard Share button from which you can print your note, email it, send it to Evernote, export to PDF, send to other PhatPad users over Wi-Fi, and share with social networks. It can also sync files to the Box, Dropbox, Google Drive, and Microsoft OneDrive cloud storage services, but you have to manually initiate that syncing. To do so, go to the files list and tap the Sync button (the icon of two curved arrows); then choose the desired service to sync with. You should periodically sync your notes to your cloud storage service so that you have a backup.